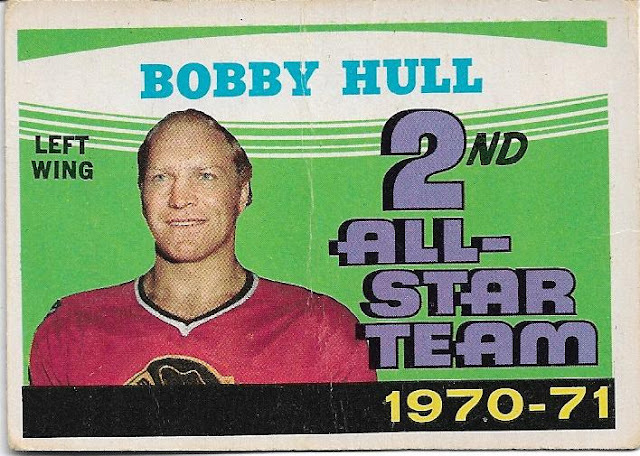 I've chronicled my love for the 71-72 OPC hockey set on this blog on a couple of occasions. 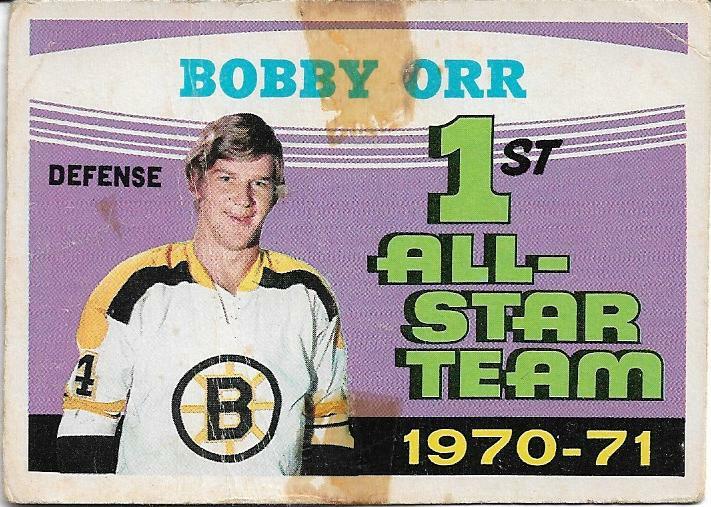 Right around Christmas, I was fortunate to see a few of these available on twitter courtesy of Dave from the Wax Stain Rookie blog (twitter ID : @parkhurstcards) . Sold! I asked him if he had anything else from the early 70's. Out come these three beauties. Yes, creases, tape marks/stains. I didn't care. When you find Bobby Hull and Bobby Orr cards from a guy you trust, you have to take the leap. Dave said "make me an offer". 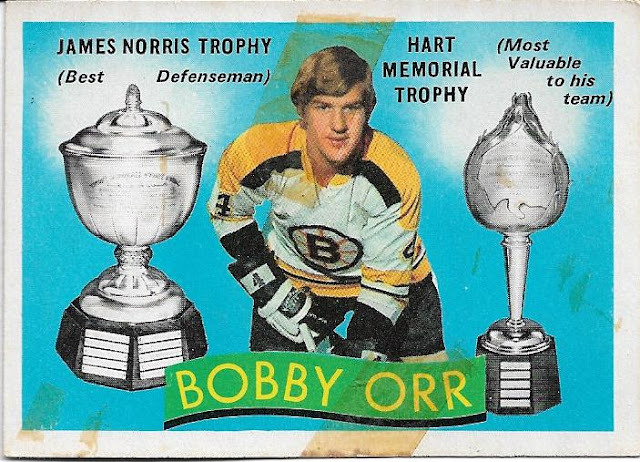 I really panicked a bit, as I looked up the values of the cards, and knowing that players such as Orr and Hull tend to hold their value even in lower conditions I was worried that I might not offer Dave enough. I threw Dave a number, hoping not to insult him. My offer was $10 over what he thought. Whew!! I love that I have these 4 cards in my collection. Dave even threw in a Joe Sakic card that I needed. If you ever have a chance to grab some cards from Dave, don't hesitate. If you ever have a chance to read his blog, or his twitter feeds (he's going through 90-91 Pro Set right now, a fun read on twitter), don't hesitate. The most entertaining part about this transaction? The time it took for the cards to arrive. My next post will have me do something I don't normally do, taking a shot at the USPS. Thank you Dave for the cards, they are great!! 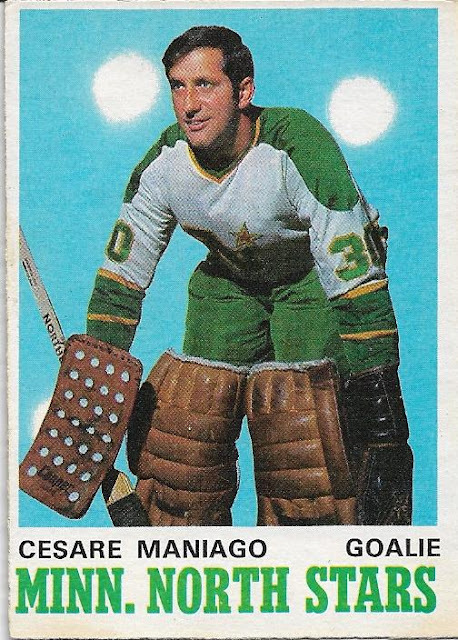 The early '70s were crappy for pop songs but damn the sets at that time -- for hockey, baseball, NBA and NFL -- are out of sight. I really hate when people say "make me an offer", it always creates instant anxiety, and that's something I don't need any more of. I'm glad to hear that it all worked out great for you though! a lot of times I would agree with you Jon, but with Dave it's different. He's very reasonable and likes to see cards get into the hands of people who will enjoy them (much like me).